This holiday shopping season, LEGOLAND® Florida Resort is giving thanks to fans with an awesome assortment of deals and discounts starting on Black Friday (Friday, Nov. 25) and continuing through Cyber Monday (Monday, Nov. 28). 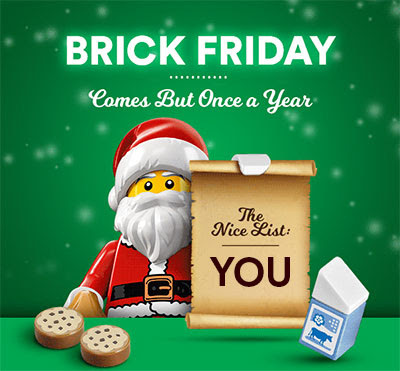 Brick FridayThat’s right — instead of one can’t-miss deal on each of the traditional days for extraordinary savings, the place #BuiltForKids is launching multiple, simultaneous offers on the day we’ve dubbed Brick Friday. Give the gift of fun with savings on everything from multiple-use tickets to annual passes, and stays at the popular LEGOLAND Hotel and the eagerly awaited LEGOLAND Beach Retreat. Visit twice and the second day is free! Purchase a theme park ticket for the low price of $71 (plus tax) to enjoy all the festive fun of our annual holiday party, Christmas Bricktacular, then come back for free to “become the ninja” when the all-new LEGO® NINJAGO® World opens Thursday, Jan. 12, 2017! This exclusive ticket only can be purchased online and cannot be combined with other offers or transferred to existing reservations. The first theme park visit must occur Dec. 17-18, 24-31, and the second visit must occur between Jan. 1 and April 6, 2017. Admission to LEGOLAND Water Park is not included. Maximum six tickets per purchase. Get an Awesomer Annual Pass at the Awesome Pass price! Purchase an Awesomer Annual Pass (valued at $149 plus tax) for the Awesome Annual Pass price of $99 plus tax — a $50 savings! Benefits include a year of unlimited admission to LEGOLAND Florida Theme Park, LEGOLAND Water Park, The Coca-Cola Orlando Eye, Madame Tussauds Orlando, SEA LIFE Aquarium Orlando, and Atlanta’s LEGOLAND Discovery Center. You also get free parking, a collector’s edition welcome kit, early access to LEGOLAND Florida Theme Park, a 10 percent discount on theme park dining, retail purchases, stays at LEGOLAND Hotel and the all-new LEGOLAND Beach Retreat, VIP Experiences, Premium Upgrades and Premium Play Bands, plus $15 off theme park tickets for up to six guests. The special $99 price is only available online and is valid only for new annual pass purchases and cannot be combined with other offers. Maximum six Awesomer Annual Passes per purchase. Please note that passes must be activated in person at the theme park within 60 days of purchase. Annual passholders save big at LEGOLAND Hotel and LEGOLAND Beach Retreat! Current annual passholders can save 30 percent off a stay at the “Five-Gazillion-Star” LEGOLAND Hotel, including all room types and themes, and the whimsical bungalows at LEGOLAND Beach Retreat, which is set to open in mid-2017. This unbeatable deal is valid for LEGOLAND Hotel stays from Jan. 1 through April 6, 2017, and for LEGOLAND Beach Retreat stays from June 1 through Sept. 3, 2017. These discounts cannot be combined with other offers or transferred to existing reservations. An active annual pass must be presented at check-in to receive the discounted rate. Meanwhile, through the end of December, non-passholders can take 20 percent off an exclusive room-and-ticket package for stays at LEGOLAND Hotel and LEGOLAND Beach Retreat. Each package requires a minimum two-night stay and includes a two-day ticket to LEGOLAND Florida Theme Park per person, with the second day free! Admission to LEGOLAND Water Park is sold separately. Stays at both accommodations include a buffet breakfast each morning for all guests listed on the reservation (not including check-in day) and exclusive early access to the theme park. The 20 percent discount is available for LEGOLAND Hotel packages from Jan. 2 through May 26, 2017, and for LEGOLAND Beach Retreat packages from June 1 through Sept. 3, 2017. Be sure to check the resort’s operating calendar online before booking as the theme park is closed Tuesdays and Wednesdays during select seasons. To be among the first to participate in these incredible deals, sign up now at www.LEGOLAND.com/brickfriday. Everyone signed up as of Thursday, Nov. 24 will receive an email with links to the eligible offers starting Friday, Nov. 25. All offers are subject to limited availability and may sell out. Note that due to fraud protections, the same credit card cannot be used more than once within a 24-hour period, so shop wisely! For more information about visiting LEGOLAND Florida Resort, including savings on advance purchase of admission tickets, multi-tier annual passes, special events, educational programs, services for guests with disabilities, VIP Experiences, Premium Upgrades, military discounts, on-site accommodations and much more, visit www.LEGOLAND.com/florida.